How is a portable phone charger a weather tool? On a severe weather day, it’s important that your cell phone’s charge can keep up with your use of radar and weather information access. Knowing when severe weather will develop, where it will pop up, how it might move, and if it is strengthening or weakening, could be the difference between staying safe and being caught in a life threatening situation. Today’s cell phone is a voice phone, text messenger, GPS locater, camera, email manager, calendar, address book, direction finder, news feed, weather source, and total information library. The more you do with your phone, the more likely you are to find that your phone’s battery has no charge, just when you need it most. What makes a portable charger so valuable? it can charge your phone when your electricity is out. There are a wide variety of portable chargers. Small units will charge a cell phone. The smallest units come up short for charging tablets. Larger units can be used to charge a cell phone or tablet, but their awkward to carry around while charging a device. So here are some personal experiences with a couple of portable chargers. 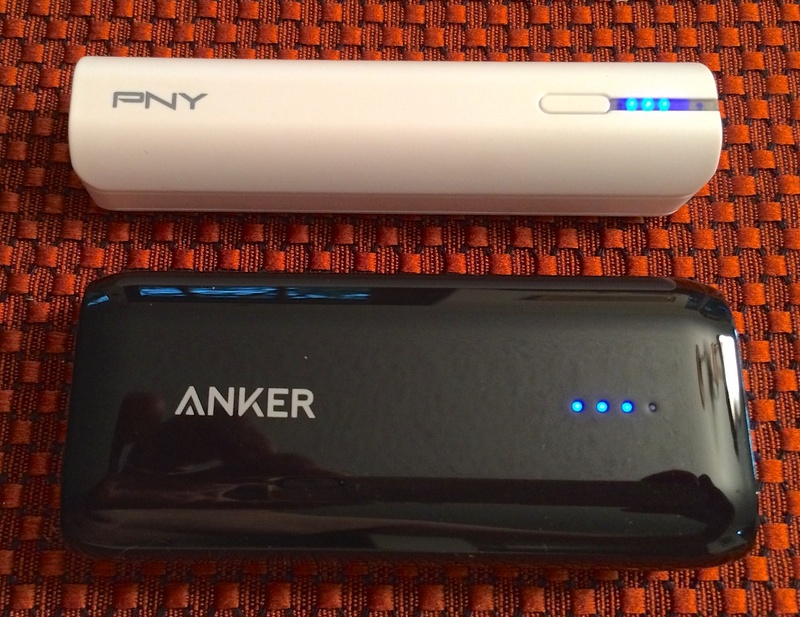 My wife and I have had a chance to try out two portable charger units. After a month of tussling each morning to see who was the lucky one to pack a PNY T2200 each day, we ordered two Anker Astro E1 models. 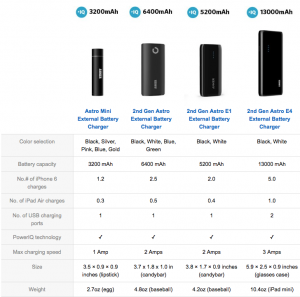 The Anker Astro E1 has a higher capacity and charging rate than the PNY. The Anker could be used to partially charge a smaller tablet. 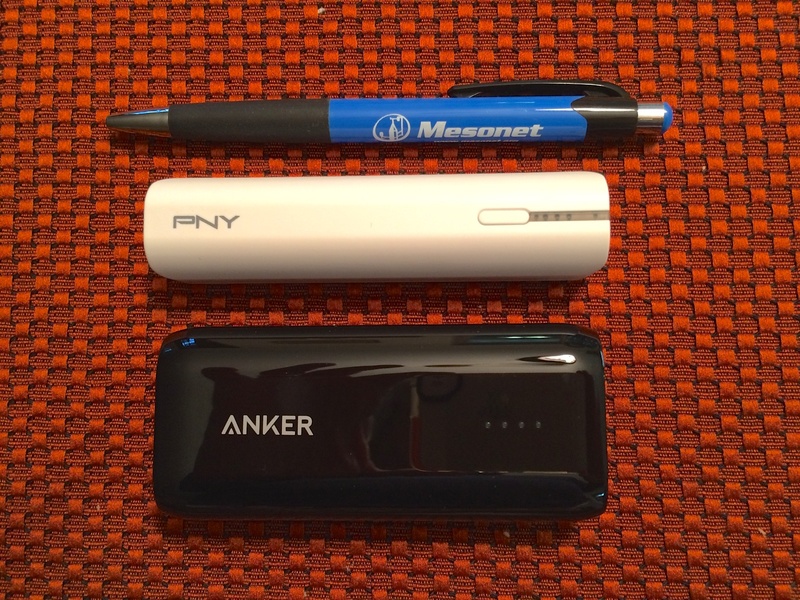 What do you need to consider when purchasing a portable charger? 1) How much power does it take to charge your device or devices? My wife and I both have iPhone 5s cell phones. An iPhone 5s battery holds 1560 mAh (milliampere-hour), so we need a charger that will deliver above that to get a full charge. A portable charger loses mAh over time, so you need have enough extra to cover that loss and what it will take to charge your device. 2) How big of a unit will fit your use? We wanted chargers that we could easily carry in a pocket. 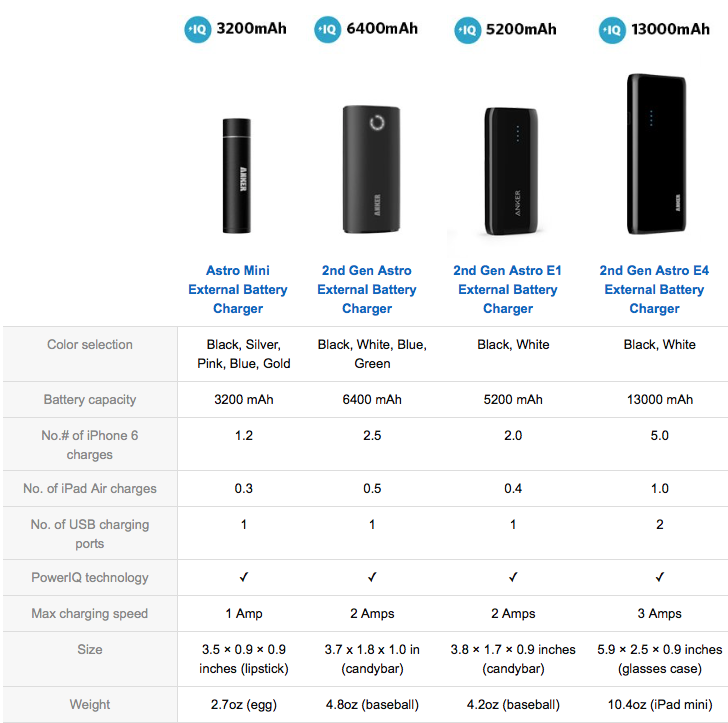 The black unit in the picture is an Anker Astro E1 rate at 5200 mAh. The white unit is the PNY T2200, rated at 2200 mAh. The pen is one of our highly sought after Oklahoma Mesonet pens. Either charger will fit in a shirt, pant, or coat pocket. 3) How many charges will you get out of it? 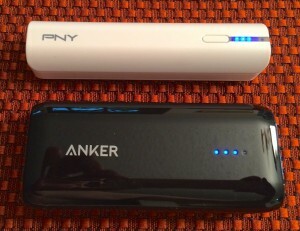 We decided to buy his and her Anker 2nd Generation Astro E1 chargers. This model has a capacity of 5200 mAh. That will give us three full cell phone charges. When we ordered these in April 2015, the Amazon.com price was $15.99. It was still that price on May 14th. 4) What is the maximum charging rate? Charging newer Android phones and tablets works better with units that deliver 2 amps or more. A 1 amp unit is typically too slow for tablets and newer Android phones. The PNY T2200 is a 1 amp charger. The Anker Astro E1 is a variable rate charger that can go up to 2 amps, so it can charge a wider variety of devices. 5) How quickly does it charge a cell phone? Here are my unofficial charging times. The PNY T2200 charged an iPhone 5s from 1% to 70% in 1 hour and 2 minutes. Fourteen minutes later, the iPhone 5s had an 84% charge and the portable charger had none. The Anker Astro E1 charged an iPhone 5s from 1% to 69% in 1 hour. After another hour and 4 minutes, the iPhone 5s reached a 100% charge. These were charged on the go, with minimal phone access during the charging time. Not really much difference in charging time between the two. I was able to recharge my iPhone 5s close to 70% battery charge in about an hour with either unit. 6) Does it have easy to interpret indicator lights and recessed activation button? Both the PNY and Anker do. Their lights flash when these units are being charged. The lights are steady when they are being used to charge a cell phone and the number of lights decreases as the stored charge is used to charge a device. Pushing the button shows the percent charge it holds by the number of lit lights. A recessed activation button helps prevent it from being accidentally pressed in a purse or pocket. Pressing the button does a battery check when nothing is plugged into it. 7) Quality of the product? There are a lot of portable charger manufacturers with good to excellent rated models. What is the down side of having a portable charger? You’ll need to carry your phone charging cord along with the charger. And you’ll have two devices to charge before a busy or stormy day. Not much to deal with for the peace of mind you’ll gain from being able to recharge your phone. NOTE: The specific models mentioned in this article are used for example and discussion purposes. Mention of these specific products rather than other manufacturers’ units is not intended to be a recommendation. The models mentioned in this article are the ones I had available for detailed comparison. The Jackery model comparison table was included as a second example of the wide range of sizes available. And I was intrigued that they are available in OSU orange. Reference and use of Amazon.com comparison tables was used as a convenient reference source for purchasing information and not intended as a purchase source recommendation. I’m bored at work so I decided to check out your website on my iphone during lunch break. I really like the information you present here and can’t wait to take a look when I get home. I’m amazed at how fast your blog loaded on my cell phone .. I’m not even using WIFI, just 3G .. Anyhow, very good blog! Glad you liked this post on keeping your cell phone charged when severe weather is in your area.